Like the song says - the future’s so bright, we gotta wear shades. Don’t listen to those who are convinced that there are only dark clouds ahead: overcrowded cities, astronomical housing prices (not to mention just a parking space), rising prices of energy...Let's not just inherit the future, let's make it. Maria, 25 years old, graduate student in global studies, frequent international traveller. Getting there from here means not staying seated in the gas-burning, smoke-belching steel heavyweights that replaced the horse and carriage. Technology, global interconnections and a need for sustainable mobility have given us a hundred new ways to move: personal light electric vehicles (LEVs), with powerful motors, rechargeable batteries and four, three, two or even a single wheel! 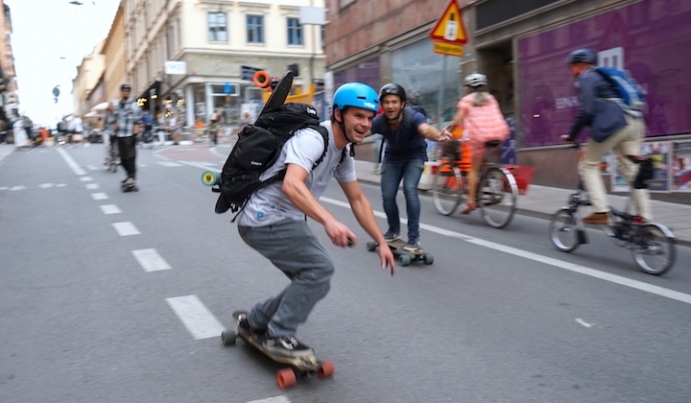 The surfer in me embraced the simplest, fastest experience possible: an electric skateboard. No fancy self-balancing gyros - just a drive, deck and trucks - it’s even truer to the feeling the makers of the first skateboards were searching for when they invented the first endless ride. The globetrotter in me opted for the Mellow Drive to surf distant cities as well. Having a removable battery (doubling as a power bank) combined with a short cruising deck mean that I can pack a wave in my carry-on - the secret for smooth sailing through growing gauntlet of airport security. Mellow’s German design and a local supply chain give me confidence of getting a durable product that won’t add itself to the already towering piles of high-tech trash. Although using an electric skateboard to save money and the planet at the same time might seem like a radical vision of the future, catching the wave of change has the same timing as in surfing. Waiting for it to crest before you react means it will usually leave you behind. Just keep an eye the horizon, spot the distant swell, and get yourself moving before it comes. Who else chose Mellow? Check out the stories of Steven and Fabi, or subscribe to the Mellow Times to get more stories in the future.